Sefaria's greatest strengths are all connected to the project of converting Torah texts from books into clean, reusable data. Data allows for power and flexibility: the power to ask quantitative questions spanning the whole tradition and the flexibility to present Torah texts in new and dynamic ways. When our Chief Data Officer Lev Israel joined Sefaria a few years back, he built something that beautifully demonstrated this power and flexibility: the Link Explorer, an interactive visualization of every place where the Talmud quotes Tanakh. The visualization started with just these two bodies of text because, at the time, they were the only pair where we had a complete set of links. In each of these visualizations, the lines represent cases where the newer text (on the bottom) quotes the older text (on the top). Many of these pairings have explicit structural relationships, which become clear as you click in to explore. For example, in the section of the Mishneh Torah that addresses marriage, you can see links clustering around four particular books of the Talmud - Yevamot, Ketubot, Gittin, and Kiddushin - the books that deal with marriage and divorce. You can also learn from what’s missing. 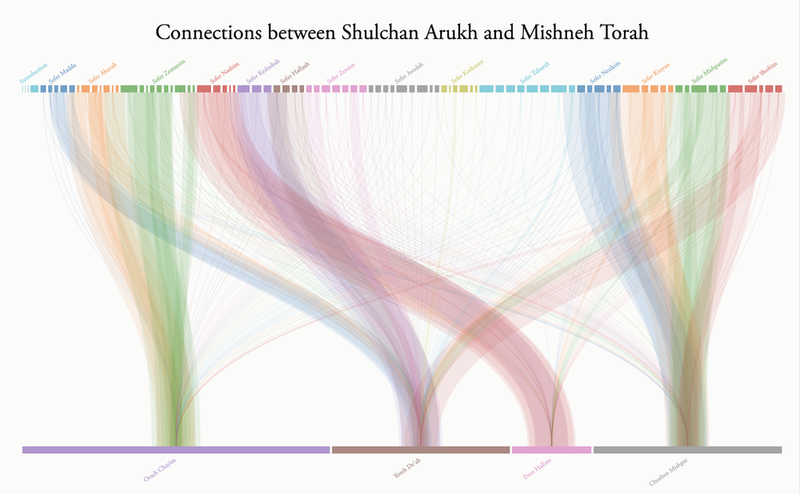 Looking at the overview of connections between Shulchan Arukh and Mishneh Torah, there’s a large empty space in the center representing parts of the Mishneh Torah that the Shulchan Arukh has little interest in. What explains this lack of interest? The Mishneh Torah is a summary of all of the laws and practices in the Talmud, including those that were practiced only in the time of the Temple, like sacrifice and ritual purity. The Shulchan Arukh on the other hand only deals with laws that were still practiced when it was written.The empty space in the middle of this graph points out exactly which sections of the Mishneh Torah deal with laws that were not practiced when the Shulchan Arukh was written in the 16th century. Together, these seven visualizations now include more than 110,000 text-to-text interconnections. Our team hasn’t yet explored every single one of them, so we’re hoping all the of learners on Sefaria can help us out. So start exploring, ask questions of what you see and let us know what you discover! Post your comments here, on Facebook, or via email to hello@sefaria.org. * Links to the Talmud in the new graphs are almost complete -- the last few tractates are still incomplete but will be available later this year. The data is being processed as we receive the English text of the Steinsaltz / Koren edition.